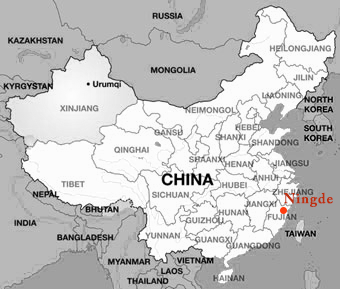 Ningde, also known as Mindong is a prefecture-level city located along the northeastern coast of Fujian province, China. It borders Fuzhou to the south, Wenzhou City and Zhejiang province to the north, and Nanping City to the west. Ningde has been undergoing a revival of its tea gardens. We work with an organic producer who is very passionate about their green teas, which have a much more delicate flavor profile than the neighboring Zhejiang teas. This entry was posted in Tea Maps and tagged Tea Map. Ningde.